On October 12th the U.S. National Library of Medicine requested that Ovid temporarily discontinue MEDLINE/PubMed updates due to technical difficulties. The NLM has also requested that we delete records from October 6th and October 7th. This will mean that the last update for Ovid’s MEDLINE feed will be dated October 3rd. The banners are currently being updated to reflect the most recent data loaded into Ovid MEDLINE. This request will not affect the EPub Ahead of Print feed. We will notify you as soon as we know when updates will become live again. For the most up to date database, please use PubMed. LSUHSC Libraries is pleased to offer a new way to search MEDLINE. DoodyÔÇÖs Precision Search is a new resource designed to simplify your search of citations added to MEDLINE?« within the last 3 years. ?á It has a streamlined, user-friendly interface that allows you to keep your search concise and your results manageable. ?á All you need to get started are your search words or phrases. ?á You can use keywords or MeSH terms (Precision Search will autosuggest terms if available), and you can use Boolean operators AND, OR, and NOT. ?áThe secret ingredient to your precision search is in the specialties. ?áWhile optional, choosing one or ?ámore specialties allows you to target articles that match your particular interests without having to compose a librarian-level search strategy (that strategy, by the way, is already built into the expert-created specialties). Once?áyou’ve?ágot some results, you can limit even further or revise your search. ?á Your results are also faceted into topics within each specialty; just expand an area to see the articles. DoodyÔÇÖs Precision Search works with our WebBridge Link Resolver to check article availability right from the citation. ?á Just click on ?áto see if we have an article online or in print, or to borrow the article via our InterLibrary Loan service, ILLiad. Citations can be exported to RefWorks or other citation managers, and you can even share citations on Facebook and Twitter. Creating a free profile is easy, and once you are logged in you will have the added options to save citations and searches, and set email alerts. For more information and to get started, please visit the library’s online resource page for Doody’s Precision Search. ?á It?áis?áavailable?áon or off campus. ?áIf you experience technical difficulties or need assistance, please contact a Reference Librarian. 4. 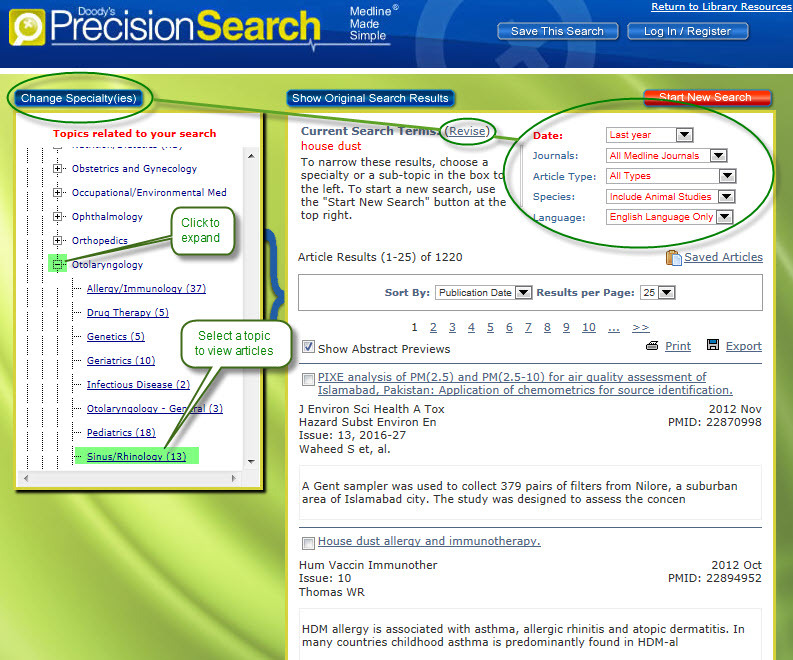 Choose between searching all journals or just MEDLINEÔÇÖs Core Clinical Journals. 2. Save articles and searches, run saved searches, and delete saved searches.